I used Cucumber shampoo and conditioner. They smelled delicious! My hair was squeaky clean with the shampoo but not to the point of stripping my natural oils. The conditioner left my hair manageable and moisturized without any heavy weighted conditioning. They also carry Pear and Honey Almond scents. 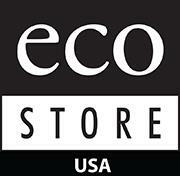 Read what EcoStore says about these products. Keep your hair looking and feeling beautiful with our 3:1 Moisturizing, volumizing, color-safe shampoos and conditioners. Each are plant and mineral-based formulations with select natural oil ingredients to gently cleanse, soften and replenish hair without removing its natural protective oils. The healthy hair care line is eco friendly and contains no harmful chemicals; they are sulfate free, paraben free, 1,4 dioxane free and contain NO Artificial Dyes or Fragrances. 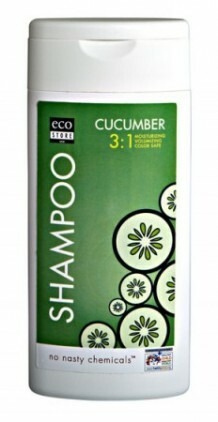 Reasonably priced at 6.50 each which is a great improvement in pricing from many other eco friendly shampoos! 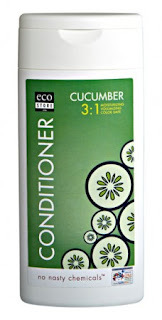 3 in 1 shampoo and conditioner that Moisturize, gives volume and are color safe. Now I did think the color safe part was unique in a eco friendly product as I visualize hair coloring as being completely non eco friendly. I do know now there are some natural hair colorings out there, but not as easy to find as the entire row of chemical hair coloring at your local Wal-Mart store. No Nasty ChemicalsTM is not only a message; it is becoming a movement. The meaning and message runs deep within ecoSTORE USA.It is not simply a marketing claim; the statement is integral to our business. In fact, our packaging carries the message. To our consumer, the message is that we provide the best ecological products to help protect health by minimizing exposure to harmful chemicals. But what does this message really mean? With ingredient selection, we take a precautionary approach. This means if there is any doubt about the safety of an ingredient, we find a safer alternative. That is why ecoSTORE USA remains completely transparent to its customers and competitors by listing each and every ingredient contained in the products we manufacture. I loveeeeeee their vanilla coconut body wash and their doggy shampoo. I contacted them about ordering in bulk. Pear and Honey Almond scents sound yummy :) thanks for sharing this great site! 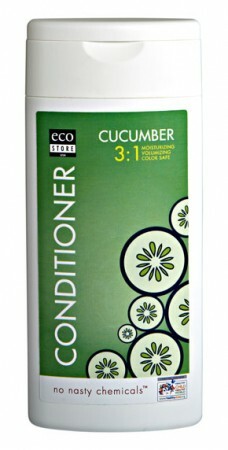 I love cucumber! Thanks for the review!